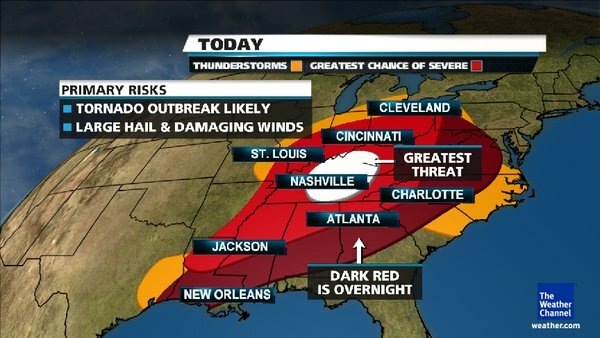 See that white spot there in the middle where it says “Greatest Threat?” Oh yeah…that’s right about where I live. At least we aren’t in the overnight area. It may not be considered the greatest threat area, but nighttime tornadoes are more likely to cause casualties, because people are often caught unaware or unprepared. Near the ground, there’s a layer of warm, humid air and strong south winds. In the upper atmosphere, you’ll find colder air and strong west or southwest winds. The air near the surface is much less dense than the cold, dry air aloft. This condition is called instability. It means that if the warm, moist air can be given an initial push to move upwards, the air will keep on rising, sending moisture and energy to form a tornado’s parent thunderstorm. 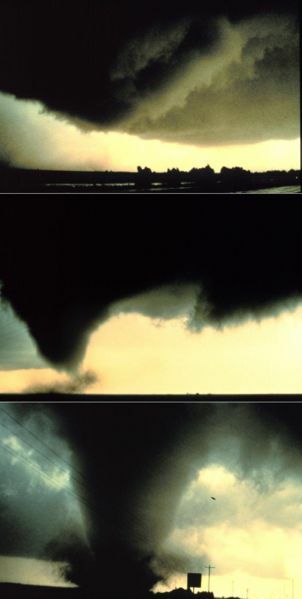 This series of images that I found on National Oceanic and Atmospheric Administration government website is helpful in illustrating the formation of the funnel cloud. We’ve already had a t-storm earlier this morning and right now the day is bright, although the sky is still full of clouds. But the window of time today for worst threat of tornadoes is still ahead of us, between roughly 4 to 9pm. I can hear the wind picking up. This entry was posted in JustBlog Entries and tagged cyclone, Dimmitt, funnel cloud, severe storms, tornado, weather, weather map, wicked witch. Bookmark the permalink. I will keep you in my thoughts and prayers. My city was hit by a tornado last year, as was Springfield Mass… there was so MUCH damage… youtube Springfield MA tornado and you’ll see it forming over a river! Yeah, right!? We NEVER get tornadoes! The last tornado we got was an F1 and THAT was back in the late ’60’s! An F3??? Nope, not in the last 100 years… add to that the hurricane we got as well as a record winter last year that dumped over 150 inches of snow on us, causing buildings to cave in and entire streets to disappear as we ran out of places to put the snow, AND the earthquake that rumbled buildings… it was a HELL of a year for disasters!